Do you have a student who has recently lost a parent? 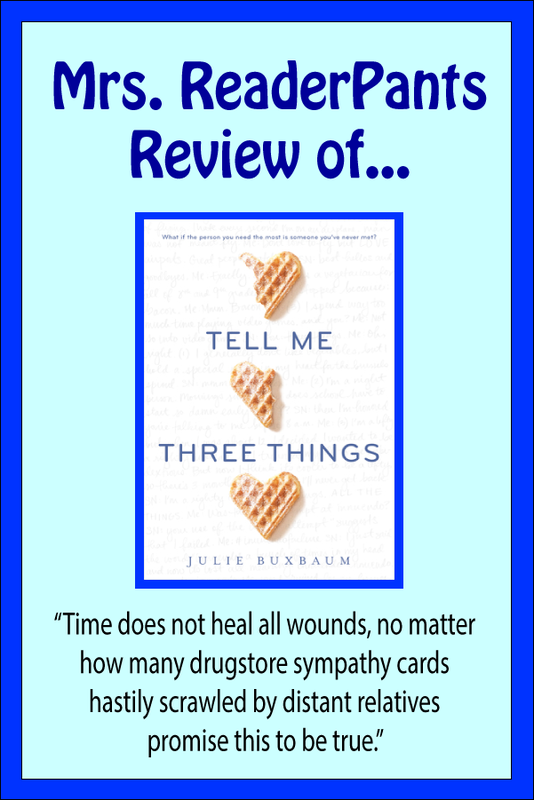 Tell Me Three Things is a must-read for any student struggling with grief. The writing is authentic, and students who have lost a parent recently will identify with Jessie's grief over losing her mother. SUMMARY: It's been two years since Jessie's mother's death, and her father has just eloped with a woman he met online. Now, Jessie has to move from her Chicago home to live with a new stepfamily in Los Angeles. Jessie is enrolled in a posh private school, where she quickly learns that she isn't nearly up to the standards of her tanned and beautiful new classmates. But then she receives a mysterious email from someone calling himself "Somebody/Nobody" or SN for short. SN claims to attend Jessie's school and starts giving her guidance on how to find friends and start to fit in. 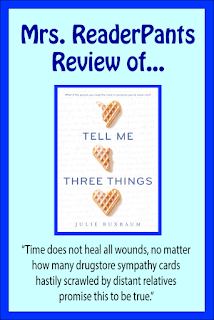 WHAT I LIKED: Jessie's grief over losing her mother is so authentic, which is not surprising if you read the heartfelt author's note at the end. Even before I read about the author's losing her own mother at age 14, I figured that the writer had lost an important loved one in her life. Jessie's pain was just so well-written and believable. I really loved Theo, Jessie's stepbrother. No, this isn't one of those stepbrother/stepsister romances like the gag-worthy Did I Mention I Love You? (how gag-worthy?). But I did love Theo's sarcasm and how he pretended not to care about things when he really did. Like Jessie, Theo is also thrown into an abrupt step-family situation he didn't ask for. WHAT I DIDN'T LIKE: Aside from the strong writing, the storyline just isn't all that compelling. It was very easy for me to put the book down, and the identity of SN was obvious from the very start. I kept wondering why everyone seemed to fall for Jessie and why so many people feel compelled to tell Jessie how "strong" she is. And the dad. Hells bells, what was he thinking? No, sir, it's not a great idea to marry a complete stranger and uproot your teen daughter to move thousands of miles away. No, it's not a good idea to throw her into a new home that isn't hers with a strange family that she's never met. No, it's not a good idea to separate your teen daughter--who is still very much grieving her mother's death--from all the friends and relationships she's ever known. No, it isn't okay to take her away from a school where she's in the running for valedictorian and put her in a school where she's an insignificant nobody and a target for bullies. Seriously, your daughter will be away at college in less than two years. Is it really that difficult to wait for the marriage for a little bit? Maybe introduce your future wife to your daughter and give her a chance to adjust? THE BOTTOM LINE: I'm kind of neutral on this one. I loved the writing and the way the author presents Jesse's grief. I was ready to reach in and choke Jessie's dad. I was a bit bored with the story, and Jessie seems a bit too much like a special snowflake. STATUS IN MY LIBRARY: On order. Jessie's grief will speak to some readers, and for that alone, it's well worth having in the library.